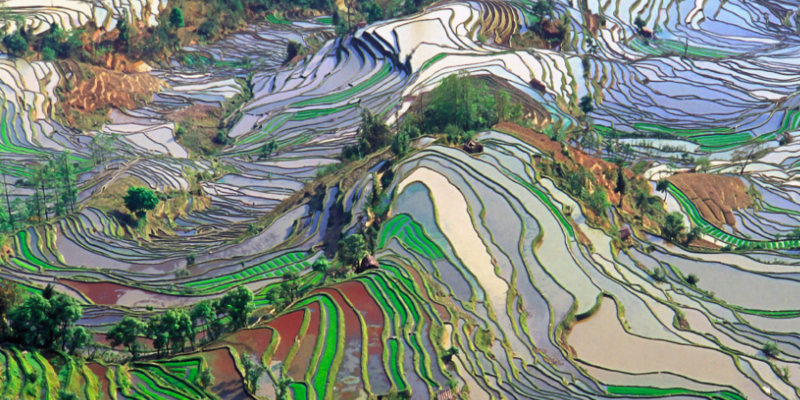 Chinese prose poetry today is engaged with a series of questions that are fundamental to the modern Chinese language: What is prose? What is it good for? How should it look and sound? Millions of Chinese readers encounter prose poetry every year, both in the most official of state-sponsored magazines and in the unorthodox, experimental work of the avant-garde. Recite and Refuse makes their answers to our questions about prose legible by translating, surveying, and interpreting prose poems, studying the people, politics, and contexts that surround the writing of prose poetry. Authors discussed in the book include Ke Lan 柯蓝, Guo Feng 郭风, Liu Zaifu 刘再复, Ouyang Jianghe 欧阳江河 and Xi Chuan 西川, in addition to many others. Scholars have called the book "innovative, insightful, and theoretically creative"; "a wholly original work of scholarship that is set to rewrite the paradigm through which we consider modern and contemporary Chinese prose poetry." In The China Journal, Michel Hockx wrote that he "enjoyed every single page of this book." It was also reviewed generously by Wang Pu in the China Quarterly here, and by Todd Foley in the FLSC, here. I did an interview about it for NBN here, and you can order it from the Hawaii University Press here. 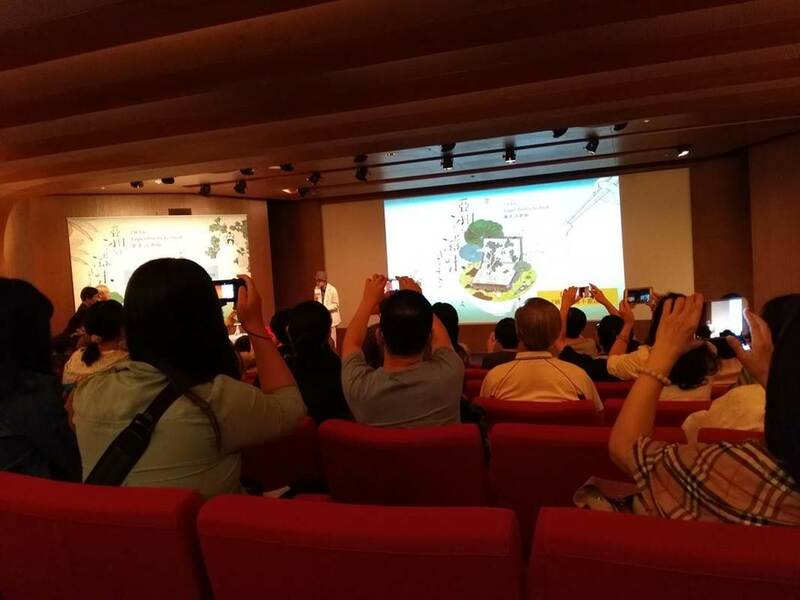 I was lucky enough to attend an international poetry reading in Taiwan in 2016, and what I saw and learned there provoked this essay: "Forms of World Literature and the Taipei Poetry Festival." World literature, it argues, circulates in very particular forms: the anthology, the work of literary criticism, and the international writers' festival, among others. I compare anthologies (like the Ecco anthology) to literary criticism (like Emily Apter's work) to the Taipei festival to see which forms of world literature are most equitable, most open, and least boring. Click on the essay title here (and below) to download a PDF. My essay in the Oxford Handbook of Modern Chinese Literatures is called "Genre Occludes the Creation of Genre: Bing Xin, Tagore, and Prose Poetry." It studies the way that Bing Xin helped found the genre of prose poetry by using modernist beliefs about the form and content of poetry to translate the work of Rabindranath Tagore, and argues that the stable presence of a genre prevents us from visualizing the origin of that genre. It also shows what I think is a standard genealogy for many qualities of Chinese literature -- forged in the very act of transnational borrowing, neither beholden to source texts nor ignorant of them. I wrote a polemic for the Critical Flame called "Six Proposals for the Reform of Literature in the Age of Climate Change." It makes the argument that a revolution in literary content is probably insufficient to respond to our present climate crisis, and lays out potential changes in literary form and practice that may have better results. It is modeled on Hu Shi's 1916 essay about Chinese language reform. It was translated into Chinese as "关于气候变化时代文学改革的六点建议" and republished at Chinadialogue. I edited and contributed to an issue of the Journal of Modern Literature in Chinese called Lu Xun's Yecao: Layers of the Real. The contributors are all trying to understand 《野草》, sometimes translated Wild Grass, Lu Xun's 1927 collection of prose, poems, and prose poems. My introduction to the issue, "The Title of Yecao," takes up the question of the translation of the book's title. My full-length essay, "The Poetics of Hinting," sets itself the difficult task of understanding the collection as a whole, arguing that it is structured as a long, slowly unfolding literary hint. Click on the essay titles to download PDFs. Before I completed Recite and Refuse, I published some of its most basic arguments in an essay called "Trading Metaphors: Chinese Prose Poetry and the Reperiodization of the Twentieth Century." By understanding periodization as a metaphor -- useful only when it identifies similarities between distinct texts -- the essay challenges the standard narrative of the history of prose poetry, identifying a sea change in work produced before and after 1949. The piece also includes translations and readings of poems by Shen Yinmo 沈尹默, Liu Bannong 刘半农, Ke Lan 柯蓝, and Huang Yongyu 黄永玉. My first full-length research essay was called "A Music for Baihua: Lu Xun's Wild Grass and 'A Good Story.'" It carefully reads the prosody of a single prose poem, and then contextualizes the poem's rhythms and structures in early twentieth-century Chinese literature. It concludes that the poem innovates musics and meters intended to aestheticize the brand-new language that we now call Modern Standard Chinese. 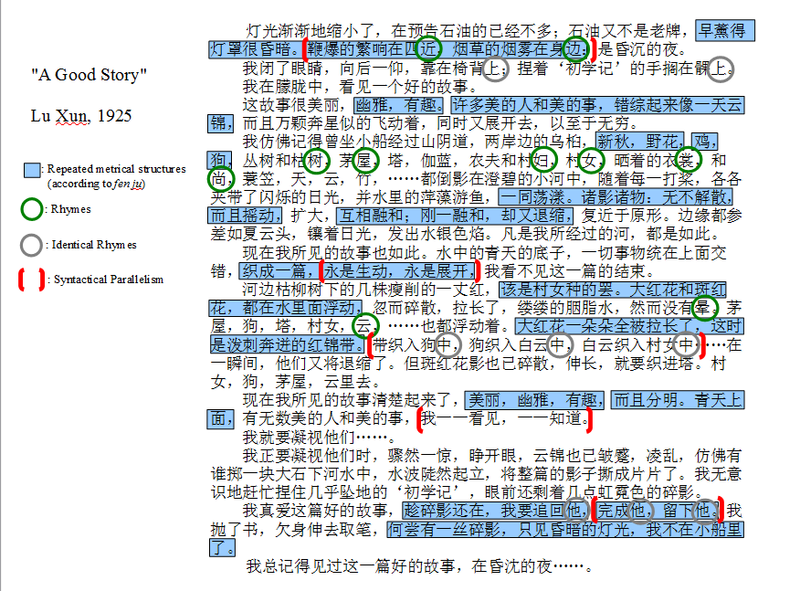 The methods of the poem (see the adjacent annotation) repeat continually in later Chinese poetry and lyric prose.